225% efficient. Can pay for itself in 5 years. Locating - Small enoughble to fit through a loft hatch. Usual installation would be suspending from the roof rafters by accoustic hangers or on accoustic matting on a board over loft joists (not supplied. Cupboard installation or under floor installation is also possible. Ducting Outlet - The ducting to and from the LD800 can be flexible but should be insulated (not supplied but all duct size are common sizes). Outlet duct will usually be 250mm and to a central point in the home such as the top of a stairwell in the ceiling together with suitable vent cover (not supplied). This will elliminate any feeling of draft. People may feel draft from moving air despite the air temperature always being warmer on the outlet than the inlet withthe Ecor Pro LD800. 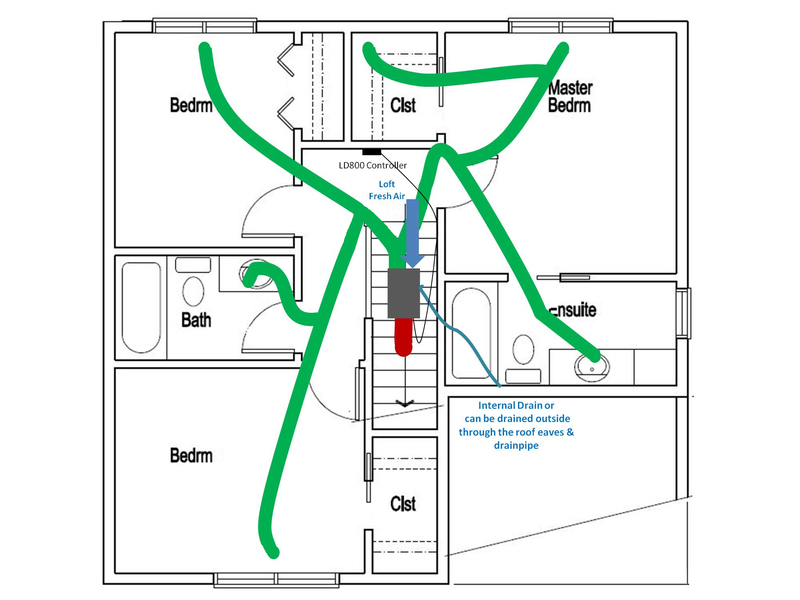 However, the outlet can be split with tee-junctions to give several outlets of dry fresh air in the home if required. Fresh Air Control - No need to put an inlet through the roof. The fresh air inlet duct of 150mm can simply be left off and the LD800 will then take fresh air from the loft space. This loft air is also slightly heated from the living space below. The LD800 captures that escaping heat and again puts the heat back into the home. Alternatively, outside fresh air can be taken from a roof chimney or a simple eave vent. Control - The LD800 can be used with an Ecor Pro external low voltage regulator and fan controller that the user will often locate in the living space. Just like the common heating thermostat, the user can regulate air drying or just have the system on fan only to filter fresh air around the home only without drying. Fresh air is continuously drawn into the LD800 heat recovery ventilator which is vital for healthy living. The heat from this air is also retained. Even if cold outside air is used as fresh air the system will always prodive warm fresh air. Not having enough fresh air can cause headaches, itchiness and breathing complaints. If we seal our home to provent heat escaping we trap in humidity and create stale air. Fresh air helps prevent drowsiness, headaches, itching and smells. Putting fresh air into the home & energy efficiently is the clever part of the LD800. The home owner sets the amout of LD800 fresh air allowed in the home with a control slider on the product. Maximum comfort and energy efficiency that you regulate to suit your own home needs to give the right flow of fresh air. This fresh air is filtered & then mixed with the air from inside the home that the LD800 has collected and also filtered. This air from the home has been collected often through second floor ceiling vents in bathrooms & bedrooms. Ecor Pro's LD800 tough epoxy coated metal cabinet is very tough and durable but operation is quiet. Filtering is with professional HEPA type filters that are readily available and as its the same technology as high end air filters. A big help for the home to help with anybody suffering from allergens. The LD800 can save on the purchase of an air cleaner that often only dioes a small area. Even the energy used to power the LD800, it also retains the latent heat from the home moisture and puts that back into the home also. Energy output is least 225% in normal operation which approximates to recovery initial product cost outlay in around 5 years. Note transportation tie wrap must be removed once in position & being operated.